1. Soak the kidney beans overnight or for 6 hours atleast. 2. In a pressure cooker, add the soaked b eans, tomatoes, onion and chillies. Pressure cook in 5 cups of water until the beans are soft and mashable. 4. Bring the soup to boil, add salt, pepper & ajinomoto and simmer for 10 minutes. Serve hot, with a topping of grated cheese. Rajma is the key ingredient in this soup. It is protein rich and healthy. Hi thks for visiting my blog. that is an innovative recipe u have here. Have never tried rajma in a soup form. Will try to do something about the site feed issue but not too sure. Thanks Vandana...it is a change from regular soups...and healthy too.I think Indians will relish it. Love this! My kids and I would have this any day for lunch or dinner - Healthy and YUM! 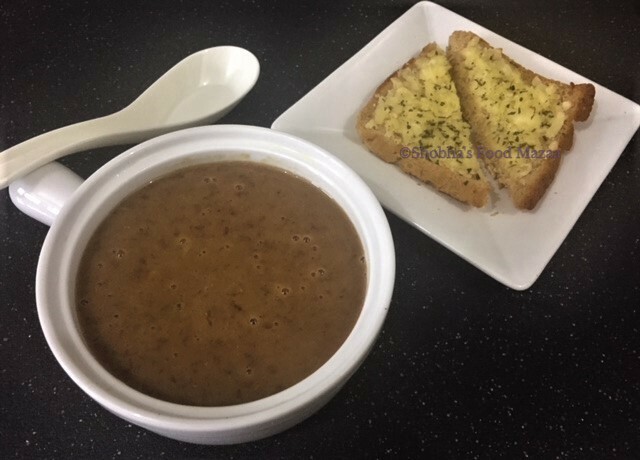 very delicious n healthy soup..new to me..thanx for linking it to my event..
Bean soup looks healthy and filling. Thx for linking to the event.